As the first Eco-mall in Singapore, City Square Mall carries on its tradition of bringing Earth Hour to the mall with activities that focus on resource-saving, for all in the family before, during and after the hour. 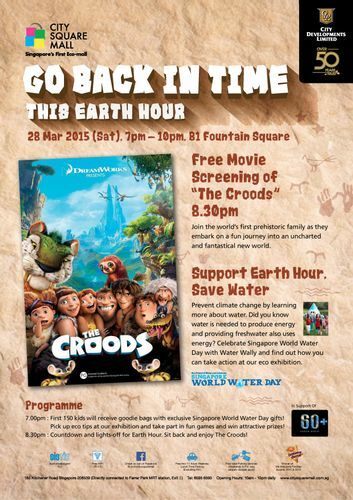 As the lights go out at 8.30pm, families will also be treated to an outdoor screening of The Croods. Journey with The Croods as they discover new technologies and the importance of family, love and kinship, in a time before the advent of electricity.